Annual eye exams are essential in protecting your vision and health. Before the actual exam your optometrist will ask you a few questions about your vision history. If you currently wear contacts or glasses, it is a good idea to bring them to your appointment. 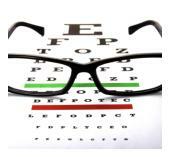 Most people are familiar with the Snellen letter chart, which is used to check the sharpness of your vision. Your optometrist will have you read letters of varying sizes from the chart to determine how well you can see them from across the room. To test your near vision, a smaller, hand-held chart is used. This simple test is used to see how well your eyes work together. Your optometrist will have you focus on a small object across the room, then alternately cover each eye. Then he will do the test again, but have you look at something closer. Usually performed during your initial exam, this test will rule out color blindness. Although color blindness can be hereditary, the test can help your eye doctor rule out certain eye health problems. During this test, the lights will be dimmed and your optometrist will shine a light in each eye as you fixate on a large target. He or she will use a machine to flip different lenses in front of your eyes and observe how the light reflects from your eyes. This will give your eye doctor a “rough estimate” of what your eyeglass prescription should be. This procedure is similar to retinoscopy, except here your eye doctor will ask you which lenses are clearer as different ones are placed in front of each eye. Your answers will help him or her refine the lens power and ultimately determine your final eyeglass prescription. The slit lamp is a microscope that enables your optometrist to look closely at both the external and internal structures of your eyes. He or she will have you place your chin on the chin rest, then shine the lamp’s light into your eye. This highly magnified view will reveal signs of infection or disease. Aside from these procedures, your eye doctor may recommend that more specialized tests be performed. If you live in or around Dallas and you have any questions regarding your eye exam, please do not hesitate to contact us.